Osage River manufactures outdoors and tactical gear for the range, camp, trail, and out on the water. They specialize in catering to the needs of campers, hikers, hunters, and fishers. The company’s mission is to balance the requirements of all their gear to meet demands for survival, comfort, and tactical performance. The Osage River Tactical Range Gear bag is a spacious and versatile bag for storing your handguns and accessories, camping gear, or hunting accessories. Osage designed the bag for indoor and outdoor range use, as well as extended hunting expeditions. The Light Duty Range Bag and Standard Duty Range bag are similar, with the Light Duty measuring a total of approximately 1063 cubic inches and the Standard measuring 2340 cubic inches. The Light Duty bag, with its seven compartments, is perfect for one or two pistols, a few accessories, and some ammo, while the Standard Duty bag is an excellent fit for two or three handguns, accessories, and plenty of ammo. We like that Osage River gives buyers different options as to what size range bag to purchase. If you aren’t sure which size is right, the Light Duty configuration is quite roomy for a single shooter. We also like the variety of colors from which to choose. The black and gunmetal grey options are good choices if you want a bag that doesn’t show dirt, while the coyote and OD green will match most common hunting gear. The bag’s 600D ballistic nylon is lightweight and durable. You can easily fit enough ammo in the bag for a weekend pistol training class, or a week-long hunting trip, without worrying about the bag failing. The heavy-duty zippers complement the ballistic nylon construction – you can tell they are built to last. We also liked that you can configure the main body of the Range Bag with two dividers. The dividers create three compartments; you get to choose the size of each one. You can also remove one or both dividers if you are carrying bulkier items. The exterior zipper pockets on the Tactical Range Bag are perfect for storing loose ammo, spare magazines, and other accessories like eye or ear protection or first aid items. If you have a smaller item that you want readily accessible, you can stash it in the exterior pockets for easy access. The removable pistol pouches are suitable for handing over to the range officer on a cold range. If you need to check your pistol in or out of the range, it’s nice to have a discreet removable pouch to hand over, so you don’t give the wrong impression by accident. The exterior of the Range Bag is also discreet. It has no logos identifying it as a range bag or firearms bag. If you don’t explain what it is, people are likely to think it’s a gym bag. You can always add patches or logos to personalize it, but some users prefer not to advertise that they are carrying a firearm in their bag. One of the best features, particularly for such an economically priced bag, is the no questions asked lifetime warranty. The warranty covers the bag for performance, defects, and buyer satisfaction. Warranties like that are hard to find, and they add immense value to any purchase, especially for demanding users who are hard on their gear. If the bag fails for any reason, defect or otherwise, you can get it repaired, replaced, or refunded, with no questions asked. If you buy the bag and aren’t satisfied at any point, for any reason, Osage River will refund every penny of your initial purchase. We wish the pistol pouches had Velcro or zippers. Some users have pointed out that the lack of closures may constitute a minor safety hazard, because when you open the top flap of the bag after arriving at the range, the pistols may flop out if you are careless. The carry handles and shoulder strap could use more padding, especially if you plan to load the bag up with thousands of rounds of ammunition. Some users reported frayed stitching, which may be a quality control issue. Luckily the no questions asked warranty covers this issue if it does occur. Tony C. says he’s delighted with his Osage River Tactical Range Bag’s capacity, build quality, and zippers. He carries his Glock 23 in it and has plenty of extra room for accessories and ammo. Hens says the Range Bag is well-constructed with lots of padding. He likes the fact that there are no markings on the outside and says it carries two or more pistols to the range, with room to spare for targets, masking tape and markers, a used brass container, holsters, stapler and staples, and gun cleaning accessories. I.M. says the bag is roomy; he can fit everything he needs, plus more. All of the pockets are useful because they are sized and placed correctly. He likes the fact the bag has four feet on the base, to protect the bottom of the bag from wearing out. There isn’t a better range bag for the money, especially factoring in the lifetime no questions asked warranty. 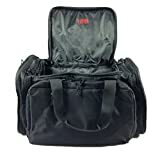 This bag is affordable, durable, and lightweight, and it will keep your guns and gear much better organized than a standard duffle or backpack.